I haven’t written about my yoga teacher training because I’m afraid if I do, I will blather on ad infinitum. It’s such an amazing process. I have to be honest: most of the time I have NO IDEA why I am doing this. I don’t see a future for me as a yoga teacher, per se. The idea of standing up in yoga clothes in front of a roomful of similarly clad people makes me sleepy, which is a sure indication that my essential self is not on board with the program. No, what I am clear on is that I want a committed yoga practice, and this is a surefire, albeit sneaky way to get me to practice every day, or at least regularly. Also, I know one of my core missions in life (Midwife Of Joy; thanks Bill M for giving me my job description) is to live fully and joyfully in my body and to teach others how to do that too. About vocation/avocation: I believe that once we are in the habit of telling ourselves the truth all the time, in every circumstance, Life takes us by the hand and guides us gently but firmly on the path we’re meant to go down, and that this path will always take us to our best possibly destiny. This path ends up being both one of service and also one of great joy, and we begin to see that we can’t have one without the other. Above is the statue of the Dancing Shiva, one of Hinduism’s wicked cool gods. I have a gigantic scholarly tome on the subject of Hindu Deities, but yesterday when Elle and I were at Forbes Library, I found a treasure trove of 8th grade level books on Hindu mythology and snatched them instead. Much more my speed these days. Shiva is one of the Big Three of the Hindu gods, the other two being Brahman and Vishnu. 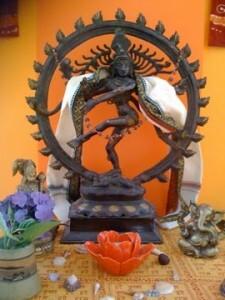 Shiva is known as The Destroyer, and he dances his way nonchalantly through and around the universe. The Five Divine Acts of Shiva are Creation, Sustenance, Dissolution, Concealment and Revelation. My homework last week was to write about how each one currently relates to my life. I want to say a few words about Concealment, because of all the Acts, this one gave me the most food for thought. Especially, as I said, because I still don’t really “know” why I am so drawn to taking this Yoga teacher training in the first place. All the reasons are in a state of concealment. I was on the phone a few weeks ago with my friend Michele the formerly Republican life coach (she voted for Obama so I can no longer count her as one of my five Republican friends.) She mentioned that she had the idea to hire me at some point to do a workshop with some other coaches on singing and voice. I got what Katryna and Dave call the Citrus Effect: shivers going up the back of my neck to my crown chakra. Or what I call the Hansel & Gretl effect: another pebble on the path begins to twinkle and shine up at me. I can’t count the times I have been asked to teach people how to sing. “I can’t,” I always say. “I’m not trained.” This isn’t true; I have studied voice with amazing teachers who have phDs from Peabody and MAs from Yale, and I’ve been what anyone would call a formal student of voice for a good twenty-seven years. Oh, also I am a professional singer. And I am writing a book about singing with one’s children. Here’s what I know about the voice and singing. 1. The voice is the nexus of body, mind and spirit. All three are engaged when one sings or speaks well. In order to sing, one must do a kind of yoga: engage the breath, the throat, the tongue and the mouth in a certain way (or ways) to achieve sounds. One uses the mind to formulate the content, especially the wordy parts, and one relies completely on the spirit for the breath. In the Tantric philosophy on which Anusara yoga is based, we all breathe in the collective breath of the goddess Shatki (one of the many names for Shiva’s partner) and it is she who breathes for us in a kind of cosmic dance. 2. When I am under a lot of stress, I lose my voice. When I take the time to connect with my breath, relax my body, let God/the goddess/the Collective Breath “sing” me instead of my trying to sing, the results are a lot better. 3. My “voice” is not just those rubbery membranes in my throat. The instrument that is my voice is really my whole body. 4. Yoga is a way we solve problems. The way we deal with discomfort on the mat is the way we deal with any kind of discomfort in our lives. So as with meditation, we “practice” with our bodies. The same can be said of singing. We can sing in a kind of absent, careless way, or we can sing with intention, with our full presence and make something holy. 5. Singing with others compounds the issue: it can bring great joy, and it can also be a place where we work out our problems and “practice” with each other to achieve literal and figurative harmony. I believe that singing is the key to long life, a good figure, a stable temperament, increased intelligence, new friends, super self-confidence, heightened sexual attractiveness and a better sense of humor. A recent long-term study conducted in Scandinavia sought to discover which activities related to a healthy and happy later life. Three stood out: camping, dancing and singing. Well, there are physiological benefits, obviously: You use your lungs in a way that you probably don’t for the rest of your day, breathing deeply and openly. And there are psychological benefits, too: Singing aloud leaves you with a sense of levity and contentedness. And then there are what I would call “civilizational benefits.” When you sing with a group of people, you learn how to subsume yourself into a group consciousness because a capella singing is all about the immersion of the self into the community. That’s one of the great feelings — to stop being me for a little while and to become us. That way lies empathy, the great social virtue. The curtain of concealment is still drawn for me, but I feel like I am beginning to peak around it. I like the concept of being ok with some things remaining in concealment until the right time. I have a hard time with not always knowing the ‘why’ of everything right now.